Dutch bank ING has agreed to pay fines and other payments of €775m ($897m; £698m) after admitting errors in its policies to stop financial crime. The bank said it regretted that its mistakes had let some customers use their accounts for things such as money laundering between 2010 and 2016. 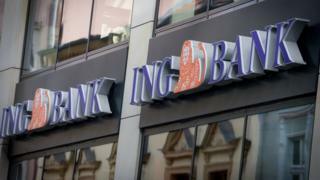 ING chief executive Ralph Hamers said the bank took "full responsibility". He said the bank's operations must "meet the highest standards" and that not doing so was "unacceptable". Vincent van den Boogert, chief executive of ING in the Netherlands, said it was "taking a number of robust measures to strengthen our compliance risk management". An investigation by Dutch authorities found no evidence that any ING staff had helped customers who may have used banking services for potential criminal activities. It ruled that the errors were not down to individuals, but more the fault of "collective shortcomings at all responsible management levels". Despite this, ING has started measures against a number of former senior employees, including holding back some of their financial packages. In a statement, Dutch prosecutors said: "Clients for years were able to make use of ING bank accounts for criminal activities pretty much undisturbed. "ING should have seen that the money streams that ran through those bank accounts possibly were coming from crime." The bank was fined €675m and also ordered to pay another €100m for disgorgement, to make up for not spending enough on staffing in the six-year period.